BURLINGTON – When director Watts Chaikin, third cousin twice removed of famed New York director Joseph Chaikin, decided to mount a new production of Rent with Lyric Theater, he knew he needed to update the show for a modern audience. What he didn’t know was how much inspiration he would draw from the state and city where he would spend months re-writing lyrics and adjusting settings and scenes. When audience members head to the Flynn Theater in Burlington next month, the Rent they will see will be a Rent that, if all goes well, they will be able to personally relate to. As the snow falls outside the building, the strains of “Snow Day But Today” drift through the lobby of the Flynn. The cast doesn’t usually get to use the mainstage for rehearsals so early in the process but, in a twist of ironic fate, the theater is having a snow day today and made the stage available to the cast. Sets are being built, but gone is the gritty Alphabet City of the 90s, replaced with scenes of modern Chittenden County suburbia. 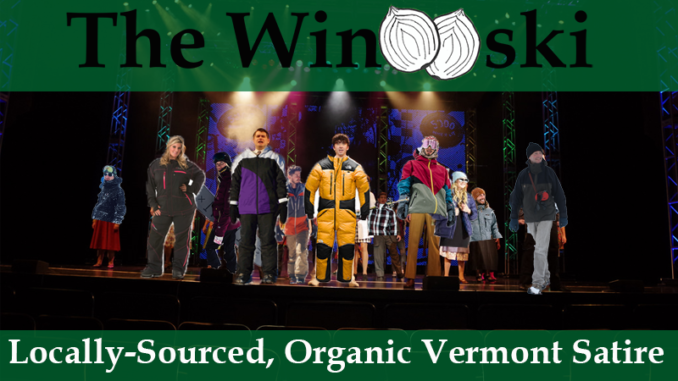 All mentions of AIDS have been removed from the show; the characters now discuss their struggles with winter in Vermont. Roger and Mimi used to bond over an AZT break. Now when their iPhone alarms go off simultaneously they look into each others eyes and say “Time to shovel again.” The cast was nervous at first about the changes, but at this point everyone is on board for the update. Rehearsal for the big Act I closing number has been paused as Chaikin shouts instructions to the cast. “I heard a ‘T’ people! No ‘T’! We’ve been over this!” What was “La Vie Boheme” has become “La Vie Vermont,” but you won’t hear a hard “T” at the end of the word. The word will be pronounced in a french accent, and the list of a song will now include famous events and people throughout the state’s history. To Bernie Bros and liberals! To wind chills below zero, Allen brother heroes, mispronouncing ‘gyro’ too! To Sammy Champlain going down the drain for what he saw! After protests surrounding the Church Street mural, Chaikin says he was very careful to include Vermont’s indigenous people in the lyrics, and points out that even the first Vermonters likely complained about the snow and ice, probably through song and dance. The only part of the show that was not updated in any way are all of the references to not being able to pay the rent.